CLEVELAND (CNS) — Amid the anger, the attacks and the sometimes boisterous nature of this year’s presidential campaign, the Archdiocese of Cincinnati is encouraging parishioners to remember that civility in politics is a virtue. To bring the point home, the archdiocesan Catholic Social Action Office has unveiled the “Civilize It” campaign, stressing that respectful dialogue can take place among people of differing political views. Tony Stieritz, director of Catholic social action in the archdiocese, said the campaign is about appreciating and valuing the viewpoints of others, especially during the election season. “This is something that has been a long time coming where we felt in addition to our ongoing message of (the bishops’) ‘Faithful Citizenship’ document that we just need to be more proactive, highlighting not just what the church teaches but how do we exemplify civil behavior,” Stieritz told Catholic News Service. He said the campaign is rooted in Pope Francis’ message to Congress in September and making it a reality in places like Cincinnati. “What Pope Francis is trying to consistently tell us is that we’re about evangelization, we’re not on the defensive. We’ve got to see how the Holy Spirit is actively working in the other person’s life,” Stieritz explained. Reflecting the wide appeal of the message, the campaign is a collaborative effort involving the archdiocesan offices of Family and Respect Life, New Evangelization and Communications in addition to Catholic Social Action. The campaign website — www.civilizeit.us — invites people to consider taking a three-part pledge to respect civility, to reflect clarity in their point of view and to encounter others with compassion. “Civilize It” kicked off in the spring with representatives of about 30 parishes learning about the initiative and ideas for the future. They received “swag bags” containing pin-back buttons, car magnets and yard signs bearing the campaign logo, all inviting people to learn more. The campaign’s basic message will be shared during sessions on the “Faithful Citizenship” document as the election moves from the nominating conventions toward Election Day in November, Stieritz said. “Forming Consciences for Faithful Citizenship” is the U.S. bishops’ quadrennial document, accompanied study guides, bulletin inserts and other discussion materials. 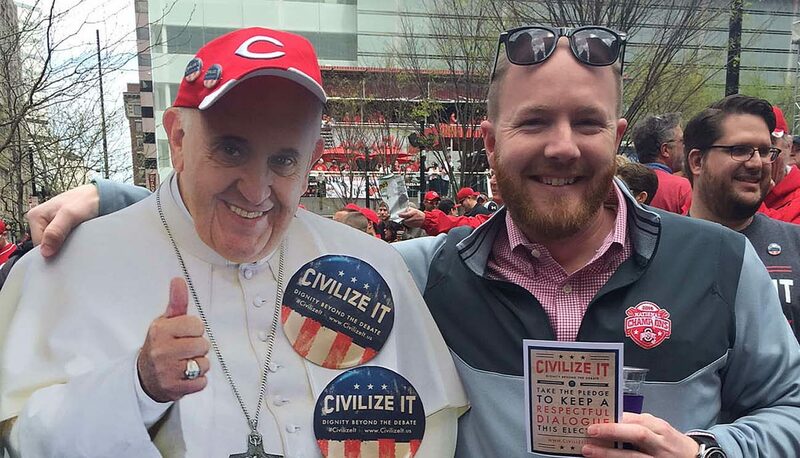 In rollouts of “Civilize It” at parishes and during opening day festivities for the Cincinnati Reds baseball season, the message has been well received, campaign organizers told CNS. At Bellarmine Chapel, the Catholic parish affiliated with Jesuit-run Xavier University, parishioners eagerly grabbed materials to display on their cars and in their yards when they were made available in mid-April, said Tim Severyn, director of social mission. “(The campaign) provides an opportunity to dialogue with each other and see where some of the common ground is in our Catholic faith and not get so caught up in the political diatribes that often sweep us away in a presidential campaign,” Severyn said. Across town, Mary Anne Bressler, pastoral associate at St. Anthony Parish, said the “idea of civil engagement” for which the campaign calls was welcomed by parishioners when they learned about it in April. “We just spent a lot of our time looking at the people in the other party and the ways they don’t conform to our beliefs,” she said, explaining that she expects parishioners will respectfully begin “to hold our own candidate’s feet to the fire” when their stances do not align with Catholic values. Both parish staffers said they hope their community’s involvement in “Civilize It” will encourage nearby parishes as well as other religious congregations to embrace the message of civility in political conversations. For the future, Stieritz and collaborators are considering plans for “civility” parties in which people are invited to come together — with food and drink, of course — to discuss key issues in the presidential campaign. “I would say without a doubt, the vast majority of people (who have seen the message) said, ‘Thank goodness somebody’s doing this. '” Stieritz said. But some also expresses skepticism, he said.